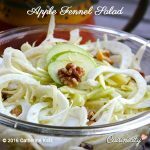 Thinly sliced fresh raw fennel, grated green apple and walnuts served with an apple cider vinaigrette, make for a refreshing crunchy, delicious and nutritious salad. It is so simple to throw together too! *I like to use a mandoline or you can also use a food processor equipped with a top slicing blade to slice finely. Place all the vinaigrette ingredients in a medium salad bowl and whisk briskly. 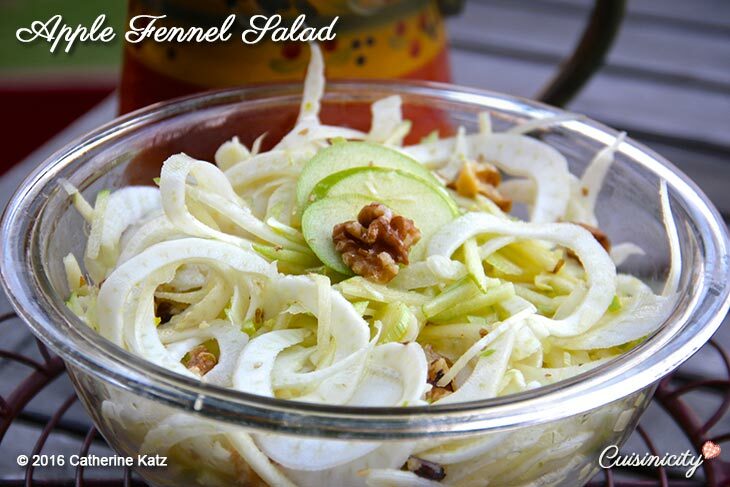 Place the thinly sliced fennel, grated apple and chopped walnuts on top of the vinaigrette and toss to coat well. Oh, how I love fennel!! I have not paired it with apple so I can´t wait to try this salad! YAY Denine! You are going to love it!